Lisa was a bright, beautiful young girl who had all the potential and creativity to be happy and successful. She also had the disease of addiction. Introduced to alcohol at age fourteen, Lisa slipped into a world of addiction and ultimate tragedy. Lisa's parents noticed alarming changes in her behavior and school work. Since there was already a predisposition to addiction in the family, her parents suspected the same with Lisa. She was becoming increasingly out of control as the disease progressed. To save her life, she was admitted to a local residential treatment center. Soon after her stay at the treatment center, Lisa relapsed. Her drug and alcohol counselor recommended that she move to an out-of-state recovery home located in Gonzalez, Louisiana. At seventeen, Lisa agreed to the move and began a successful sober journey -- but it was a journey cut short by the very nature of this disease. After six months at the Louisiana recovery home, Lisa returned back to San Diego. She was a new person. Her inner light shined once again. She remained sober, a day at a time, for three consecutive years thereafter. Her recovery consisted of going to many twelve step meetings, associating with sober friends, and carrying the message to others. Sobriety worked and it worked well for her. When Lisa turned twenty-one, she decided to test a theory -- one that she had known about but had never challenged. Lisa fell into the greatest myth surrounding addiction--a false belief that an addict or alcoholic can somehow go back out there and use or drink differently...a delusion that would take her own life. The disease of addiction is cunning, baffling, and powerful. It knows no boundaries and never takes a rest. The disease is always doing "push-ups" and is always ready to rear its ugly head. The three promises of continued substance abuse are either jail, mental institution or death. Lisa compromised her sobriety and thought she could drink differently. It didn't happen. She relapsed by taking that first drink. Her wrong choice ultimately lead to her tragedy. 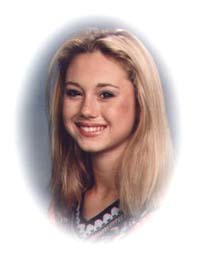 As she drove home that early morning, January 3rd, 2003, she lost control of her car and crashed head-on into a concrete retainer wall just two blocks from her home. Lisa's family got the dreaded knock on the door that no parent ever wants to get. An officer and medical examiner gave them the devastating news that she had died in a car crash. Lisa's blood alcohol concentration was found to be three times the legal limit. That "first drink" became her last. Lisa had helped many people while she was in sobriety. She is still continuing to do that but with a different message now. Her message needs to be told. Lisa's dad is a recovering alcoholic with over thirty-five years of continuous sobriety--one day at a time. He continues to share about the disease of addiction and to carry his daughter's message to others. Lisa's mom, Judy, and sisters, Jennifer and Tiffany, are also very pro-active in drug, alcohol, and tobacco prevention work. Her family has created Lisa's Light to bring awareness and to continue ongoing prevention and recovery efforts.